One of the most interesting aspects of reading is that sometimes you might read something and, regardless of whether you enjoy it or not, it begins to creep into your thinking. You start to see it everywhere; kind of like when you’re walking the streets in a strange country and you feel as if you keep catching glimpses of people you know. War and Peace has begun to dominate my thinking; I see it everywhere, in relation to everything of late. The novel has introduced me to probably the big theme of human life that I have overlooked; the way history, as a phenomenon, is what occurs as a result of the tension between freedom and necessity. Or, what choice does a person have in terms of the actions they take? How much of what they do is free will, and how much of it is predetermined by utterly mysterious forces? The last forty pages or so of the book is a kind of philosophical treatise on the phenomenon of history; how much you can make sense of it, and to what extent events are governed by choice, or are contingent on the momentum of causal forces we can’t even perceive, let alone control. To put it simply, the big things in War and Peace are the events. They dwarf all people. Tolstoy laughs at the idea of a ‘great’ man who makes things happen. Not only does Napoleon appear as a vain, egotistical buffoon, he’s almost irrelevant to the story. Tolstoy views history as being like a wave at the beach. Napoleon is the fleck of foam visible right on the crest of the wave. Talking about Napoleon as the master of the war in Russia is as foolish as looking at that swell of water and attributing its movement, all its force and consequence, to that little bit of foam on its lip. Like a wave, history is driven by currents and weather completely removed from our eye; the complex, interrelated workings of the natural world. 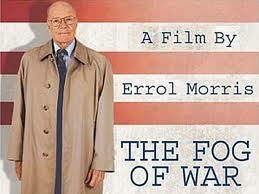 I recently saw The Fog of War: Eleven Lessons from the Life of Robert S. McNamara for the third time. It has affected me very powerfully, every time. It is mapped out on some of the same lines as War and Peace, which kind of makes sense, given that McNamara’s career was, in large part, as a master of war. Early on, in reference to the Allied firebombing of Japan at the end of World War Two, McNamara asserts that, if the Axis powers had won the war, McNamara would have been tried – and convicted, “quite rightly” – as a war criminal. Earlier in War and Peace, Tolstoy draws on his own experience of soldiering to describe the fundamentally anarchic phenomenon of battle. He says that the ability to get people to follow orders under fire and have things proceed as you envision is utterly vain. In fact, the general of the Russian army, Kutuzov, never tries to control things. He’s a sleepy, doddering old man who seems to know how to cultivate the procedure, which is going to proceed according to its own momentum, anyway. Tolstoy also writes, in relation to the Battle of Borodino, that it could never have happened without everyone agreeing to turn up and start shooting at each other. Napoleon had nothing at all to do with it – orders or no – and had he tried to call it off, the soldiers probably would have ignored him and gotten on with it, anyway. If anything, and these are just my ideas, you can see how this very radical thinking has taken root and blossomed since the book was written. Around the time of the Vietnam war, when conscientious objection had become commonplace, people had begun to understand their impact as individuals. They had chosen not to go, regardless of who ordered what. It is obvious that, by this time, people had caught on to what Tolstoy had said. And even if they weren’t listening to him, then they were like that element of water that had begun to move toward the beach, driven as it was by the cold wind blowing out across the ocean, thousands of miles away. Interestingly, while the idea obviously draws issues of responsibility and agency into question, it also throws into doubt the question of guilt. Not only Napoleon’s guilt, but the question becomes especially piquant when you are taking about someone like Hitler. How much of his responsibility is the holocaust? Tolstoy would say, not very much at all. Hitler didn’t have his hand on the lever of any gas chamber, at any time. Similarly, McNamara, as an old man, is grappling with his own sense of responsibility in relation to things like the firebombing of Japan and the use of Agent Orange in Vietnam. I have no answer, dear reader, but it is a fascinating thing to consider. This entry was posted on May 2, 2012 at 10:40 am and is filed under Observation, Reading, Real Men with tags Agent Orange, Axis, Battle of Borodino, Errol Morris, General Kutuzov, Hitler, Holocaust, Loe Tolstoy, Napoleon, Robert S McNamara, Vietnam war, War and Peace, War criminal, World War II. You can follow any responses to this entry through the RSS 2.0 feed. You can leave a response, or trackback from your own site.